In today's advanced age of technology enablement, have you ever wondered why a large number of organizations are struggling to adopt artificial intelligence/machine learning (ML) successfully? Countless organizations are increasing interest and pumping investment into incorporating ML, and many of them have successfully identified valid use cases to kick-start their ML journey. Yet, business leaders still wrestle with identifying meaningful results that stem from their AI/ML investments, and much of that starts well before the deployment of algorithms. Activities such as building out the technology environment and prepping the data create seemingly trivial, but increasingly significant challenges that influence whether AI/ML programs succeed. The initial excitement goes away, and these programs often get shelved. In most cases, these initial challenges can be avoided by instituting more rigorous thinking through each implementation step and by being better prepared to address them as they arise. If you have ever had this "failure to launch" experience before or are "sitting on the fence" right now, the following suggestions will help you overcome many of the obstacles that impede your ML journey. Initially, business leaders perceive ML as a disruptive technology. Most likely, its introduction will force business process, functional, organizational and even behavioral changes, depending on the nature and scale of the project. For example, in a predictive maintenance ML effort, managers must take into account the ripple effect that an implementation will have on areas of the business ranging from the maintenance process itself to labor relations. To enhance the probability of business success, leaders must evaluate how their solution affects these interdependent elements of the enterprise before commencing with implementation. The first step is to conduct an impact assessment to determine the potential disruption the new solution may cause. For example, a solution that requires a large number of complex process changes is almost certain to have difficulty getting through the internal approval process. Of the many issues that AI/ML project leaders will face, organizational changes or behavioral aspects of the change will be the most challenging. Enlisting a senior-level business sponsor will help to sell the project internally and to navigate through the challenges of addressing the organizational roadblocks and required process changes. Deploying ML means creating complex ML data models which analyze large data sets within a shared environment. Therefore, transactional data elements and master or reference data (e.g. customer and product details, location, etc.) must be captured, cleansed, enriched, correlated, and stored in a location that is easily accessible for your data scientists. Note that data scientists typically want to analyze raw data, so make sure that the historical, raw data structure is conveniently accessible. With various business departments serving as both the producers and consumers of data, the IT organization plays an important partnership role as the enabler by producing enterprise-wide data stores (e.g., data lake, enterprise data warehouse, or departmental data marts). Furthermore, it is crucial to store data in a modern data architecture, where business consumers have the necessary knowledge and access privileges to consume it. Deploying a modern Data Architecture along with the adoption of a mature Data Management process, will ensure that enterprise-wide data and its ML-produced insights are available to business consumers. Once the ML models are developed, they have to be embedded into the "enterprise fabric." Enterprise fabric refers to a set of best-of-breed application systems that are woven together to enable the enterprise to conduct business transactions that are secured and channel independent. The actionable output from the ML process should be captured and re-routed into the corresponding application/data systems for production use. Capturing these results and incorporating them into the ML model for continuous refinement is a key factor for model sustainment and self-learning. In fact, the term “operationalizing the model” means that the output of the model can be consumed by the organization and also captured, stored, and later incorporated into the model learning process. It’s important to understand that the lack of a defined framework, guiding principles, and adequate governance will negatively impact the return on Analytics investments and potentially cause the ML program to fail. As mentioned earlier, a robust Data Management program is necessary to ensure the integrity of the data fueling these ML models. 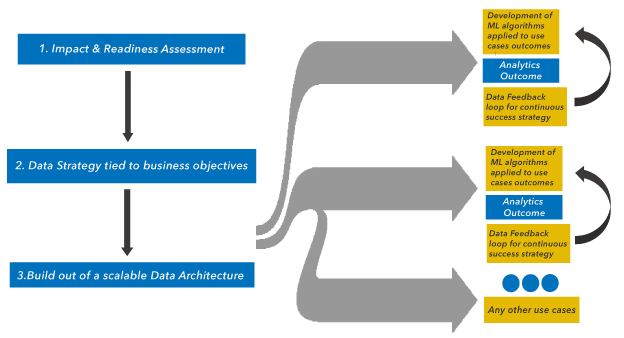 The ability to accept, store, and propagate actionable insights from ML into the broader enterprise largely depends on the maturity of the Data Management program, along with the successful execution of newly refined business processes. The enterprise's journey truly begins before the first ML model is successfully built and deployed. When a solution is developed correctly, it is a typical behavior for business leaders to quickly expand the use of ML across the business, once the first model is operationalized. The excitement is usually driven by recently discovered insights that bring quantitative value to the business along with the confidence of utilizing a robust data architecture that can support the scaling of complex solutions. In conclusion, successful adoption of Machine Learning and Artificial Intelligence relies on the enterprise’s capacity to frame an agile strategy that is supported by a robust Data Architecture and Data Management process. Think you want to do it too but need a helping hand? Every organization is unique and has its own set of challenges. Whether you are just now considering ML or are working through current ML frustrations, give great consideration to developing a robust architectural and data management capability as the cornerstone of your ML journey.